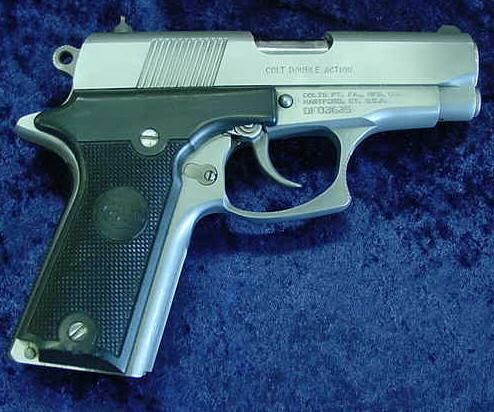 The Colt Firearms company had been producing their venerable Model 1911 Series of pistols for almost eighty years when the Double Eagle was introduced as a refinement of the Colt line in 1990. The compact version of the Double Eagle was introduced two years later to some interest, it was a compact pistol in both .45-ACP and .10mm-Auto. The Double Eagle however did not catch on in sales and by 1997 the pistol had been discontinued, there had been conjecture that the weapon would be released in .38-Super, .40-SW and .9x19mm-Parabellum chambering but it is not known if this occurred. -- TECHNICAL DATA: CALIBER: .45-ACP/.10mm-Auto CAPACITY: Both 7-rounds single-stack column magazine WEIGHT: 2,43 Pounds.